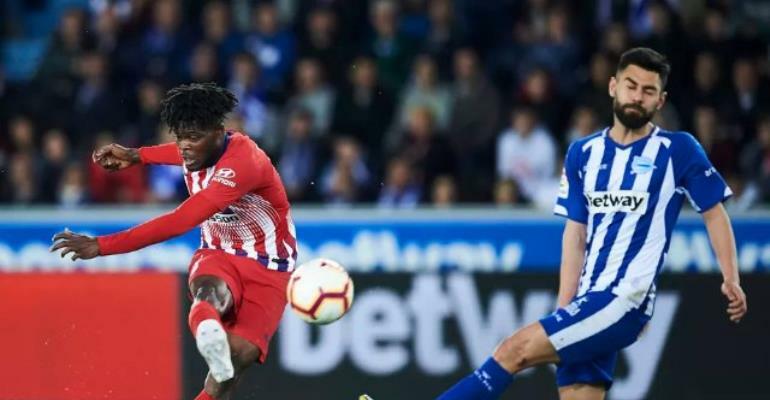 Thomas’ goal of the season contender against Alavés on Saturday night was not the first time he has rifled one in from distance. The Ghanaian now has 12 goals for los colchoneros and seven have been shots from outside the opposition’s penalty area. It’s becoming a habit and a good habit. The 25-year-old continues to improve as a central midfielder, forming a super doble pivote partnership with Rodrigo in the middle of the pitch and even thriving without the young Spaniard by his side, as was the case in the Basque Country on Saturday night. Yet this ability to strike the ball from distance is his wildcard, his party trick, his special sauce, his not-so-secret weapon. Imagine what a useful tool he’d have been in the Champions League second leg against Juventus, for which he was suspended. Of course he had a stinging long-range shot during the first leg, which was well saved by Wojciech Szczęsny, and he could have tested the Polish goalkeeper some more in Turin. With Atlético sitting so deep in that game and rarely able to reach the Italian side’s penalty area, his strikes from distance would have given los rojiblancos a chance of the crucial away goal.